The Jacob Vanderbeck, Jr. House is located on a three-acre parcel overlooking the Saddle River at the eastern end of Fair Lawn. The property retains remarkable integrity in terms of open space; its approach down a long entrance drive shelters the house from busy Dunkerhook Road, and it retains its historic views toward the Saddle River. The Vanderbeck House is a remarkably intact pre-Revolutionary Dutch stone house, built by Jacob Vanderbeck circa 1754. It is listed on the National and New Jersey Registers of Historic Places as one of Bergen County’s Early Stone Houses, and was surveyed by the Historic American Building Survey in 1938 (HABS, NJ-45). The house remained in the Vanderbeck family until 1800 when it was sold to another well-known Bergen County figure, John Garretson. After several other property transfers, it was purchased by Mr. and Mrs. Walter Squire who, in the 1940s, restored it and added a harmonious addition to the house’s east side, on the site of a former wood-frame addition. A later owner of note was Richard Vander Plaat, who was a three-term mayor of Fair Lawn and a New Jersey Assemblyman who ran for Governor in 1969. The original 1 ½-story house faces south and is constructed of coursed ashlar sandstone which remains unaltered save for the south façade, which was stuccoed prior to 1938. It is capped by a gambrel roof with clapboard gable ends, with broad shed dormers, which are likely not original, across either slope. The gable end chimney is not original, but the fireplaces beneath it are. Much historic interior architectural fabric, including floors, woodwork, and built-in cabinetry that dates to at least the late 18th century, remains extant. The 1 ½-story addition to the east is set back from the original house’s primary facade, allowing the original structure to dominate. It is detailed with stone, stucco, and a gambrel roof much like the main part of the house. While the house has been vacant for over a year, it is in good condition. There are some needed roof and gutter repairs that if left unaddressed, will begin to cause more extensive interior damage, but could be easily treated. The major threats to the building are currently not related to environmental deterioration. The property is owned by the estate of Henrietta Vander Platt, and has been offered for sale. Developers are expressing interest in the property as a site for high density assisted living facilities. Because of the location of the Vanderbeck house on the parcel, this would likely involve demolition of the house. Even if an assisted living facility is not the outcome of the sale, the sizeable parcel could be subdivided and several large houses built as-of-right on the property. Real estate professionals have marketed the property primarily as a development site, not as a historically significant, single-family house. The permanent loss of this over two hundred-year-old historic structure would be short sighted and regrettable. The threat could be mitigated by marketing the house to a historic preservation-minded buyer who could agree to preservation easements that would protect the property. 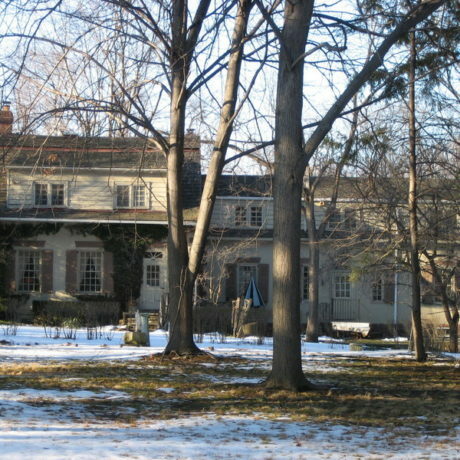 PNJ listed the neighboring Naugle House on its 10 Most Endangered Historic Places list in 2007, and the municipality of Fair Lawn has since taken a big step toward its preservation, purchasing the property with the assistance of Bergen County in 2011. PNJ applauds their dedication, and suggests furthering the preservation of early Fair Lawn via the thorough investigation of all options to save the Vanderbeck property as well. These rare neighboring remnants of the earliest period of Bergen County development present a unique opportunity to create a remarkable 18th century historic district. The municipality could designate the house a local landmark, thereby using its regulatory powers to help prevent the tear down of the Vanderbeck House. The house could easily be stabilized until an appropriate new owner can be found, and if the State of New Jersey passes in the near future a Historic Property Reinvestment Tax Credit, a measure which PNJ has been advocating in support of for several years, that might provide an economic incentive to a new owner to keep and restore the house. The rehabilitation of an existing building for the same use or a new use is inherently more sustainable, as it conserves energy and resources. In this case, this approach would also preserve a culturally significant building that is a documented landmark to Fair Lawn, Bergen County, and New Jersey. Preservation New Jersey urges all interested parties work toward making possible a reuse that does not result in the demolition of this historic house, but instead, furthers Fair Lawn’s burgeoning preservation efforts.